Hollywood, ever the contrarian, has asked us in the past to support our local sheriff. And then to support our local gunfighter. That’s confusing and just generates a hard-to-resolve quandary. The proposal I have here is far simpler – support your local show. Be it never so humble – if it is only 30 minutes or so away from home ,then we all really ought to do so. There are several reasons, chief of which is that it is a fine way to spend an hour or so at the very least, and it really will help generate some funds for the club running it – or at the very worst some needed publicity. Take for example the Letchworth Showcase which was held on the 30th of October. 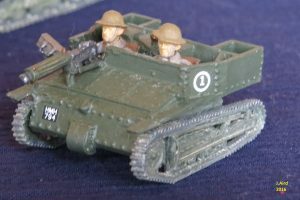 This is predominantly a modelling show, with a few sellers of mostly new and second-hand kits in attendance, alongside the club displays and painting competition. However, there were also a couple of gaming traders – Parkfield Miniatures and Early War Miniatures/Sword & Scabbard Books. 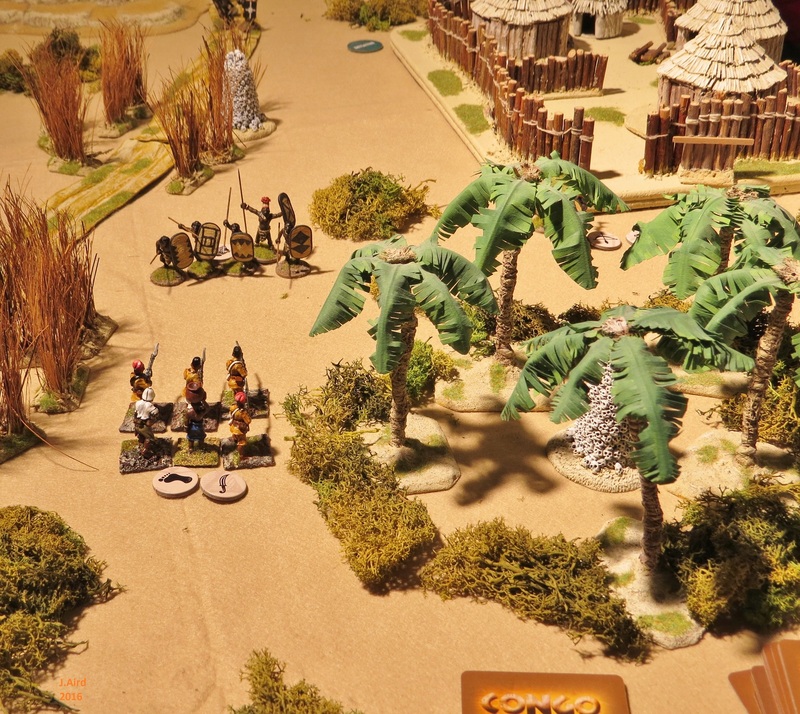 Paul Day, who runs the latter, also had a participation game of “Congo” – the latest set of rules for adventures in a fictionalised 19th century Africa. 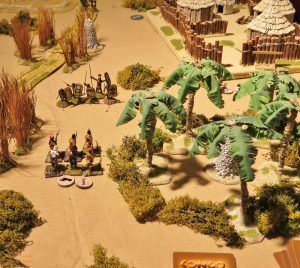 This game pitched a party of western explorers, with African auxiliaries, against a hostile tribe somewhere between the jungle and the plain. This is a fun system, using card selection to control moves and accumulated “stress” counters to slowly destroy the morale of the sub-units that make up each side. Very enjoyable – and not just because I sneaked a victory by having one unit basically run to the opposite table edge to gain the “exiting the table” victory points. Another game on display was a tank duel between 2 Shermans and a Panther. This also had some nice mechanisms, particularly for movement, but did allow tanks butting against each other track to track to not score a hit even though the end of the main armament was resting against the opponent’s turret. Slightly odd, but the players seemed to be enjoying it. The actual model show had some nice items on display – although the lighting was so poor it was hard to view all of them at their best advantage. Fortunately, the painting competition had been given a brighter corner. Overall – a fun couple of hours, including an enjoyable game, with minimal travel and free on-street parking (it was a Sunday). Of course, not the greatest show ever, it’s no Salute. However, in past years it has been at a larger venue and had more traders – maybe that’ll happen again as long as enough casual attendees keep the faith. And that’s another reason to support a local show!